Our road trip to Darwin took us back to Alice Springs. I did say in my last post that it was a rest day but we had so much to do with shopping, chemist and waiting for the liquor stores to open at two, that it became very busy, plus we had a bigger happy hour than we meant to with our friends Ian and Kay and some new people we met that night. Saying goodbye to Ian and Kay was sad as we’re not sure when we will run into them again but hope to. Anyway, Darwin is almost 1500kms from Alice Springs and we decided not to rush the journey as there we plenty to see and do along the way. We had decided to make Devil’s Marbles/Karlu Karlu our goal for our camp that night, another place I’ve always found interesting, and wanted to see. Along the roads we travelled we went through or near many interesting little and big places one such place was Aileron, about 135km from Alice Springs and 370km from Tennant Creek. Interesting because of its giant indigenous statues that are on the landscape as you drive through. High up on the hill overlooking the roadhouse is ‘Anmitjere Man’, quite a protective looking statue of 17metres in height, weighing 8 tonne, with his large spear ready to defend. To the side of the roadhouse is his family ‘Anmitjere woman and child’ who appear to be having a lizard problem. Huge and fascinating are these large pieces of art created by sculptor Mark Egan. Well worth a look and photos. We passed through Tennant Creek but didn’t stop for any photos, this was 100kms from our destination for the night. Upon arriving at the Marbles we set up and after a cuppa went out for a walk, even though it was hot, to check these huge boulders, go the information area to make use of free wifi, for a change, and to learn about these huge boulders. This is a conservation area so there is a small fee for a night of $3.30 per person, not an issue, there are three toilets blocks and plenty of spots for camping with fire pits. No shade but it was only for the night. Walking around these huge boulders is quite moving as this is a spiritual and sacred place for many aboriginal tribes. They prefer you don’t walk on the rocks out of respect and we didn’t. Read about the Marbles here http://en.m.wikipedia.org/wiki/Karlu_Karlu_/_Devils_Marbles_Conservation_Reserve We met a lovely bunch of young men here. One from Sydney, one from Canada and the third from France. Very lovely and polite young men, all in their early twenties, we would bump into them in several places along the way after this. Since Uluru we have been seeing lots of Model ‘A’ Fords. These beautiful old cars were travelling to Darwin for their annual rally this week and each time we passed one the people in them were only to happy to wave and give us a beep on the old wahooga horn. At Daly Waters we ran into about four of them and learnt what they were up to and we saw the boys again. This iconic pub was well worth a look but the Caravan park attached to it was very overcrowded this particular Saturday night. There is always live entertainment here and apparently their meals are pretty good. 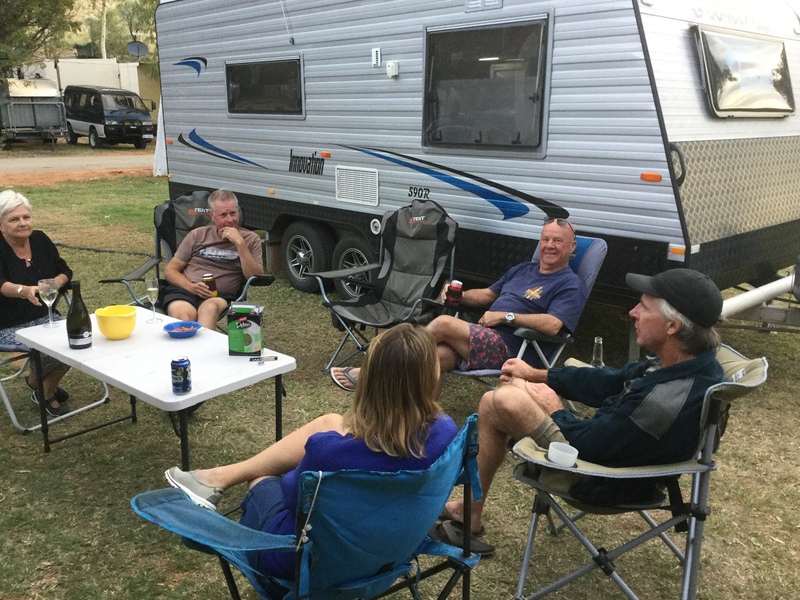 We had a drink at the bar and went back down the road to the Hi-Way Inn Caravan Park where we spent the night with a free drink each at dinner and had plenty of room in the campground. It was here we met Brigene and Orla two Irish girls who came out here to holiday and work. They we absolutely fabulous girls and were the reason we came back to stay as they sold the place. Dinner for me that night was the biggest Scotch fillet with Dianne sauce, salad and chips and Murray had a large chicken Mexicana with salad and chips. We didn’t need anything else after, I tell you. This was a big night but a funny one. The next day we set off for Adelaide River and our next stopover at the Adelaide River Show Society Caravan Park. We had a stopover at Katherine for lunch in a lovely park by the river. Mataranka Springs was another stop that day and it was fascinating to see the lovely clear water of the springs, it looked relaxing but we wanted to move on. We had a quick set up at the Showgrounds in Adelaide River and relaxed with a lovely dinner of spaghetti bolognaise. The temperature was high thirties and it was lovely when the sun went down. This was a lovely spot but the bugs this night were absolutley dreadful. We couldn’t have a light on at all, which was disappointing but on the other hand Murray did get some great sunset shots and a lovely sunrise the Monday morning. Before we hit the road for the last leg to Darwin on Monday morning we called into the War Memorial Cemetry at Adelaide River which was absolutley beautiful, in a lush green setting among the trees. Darwin here we come. Cheers xo. This entry was posted in Adventure, Challenges., everything, Northern Territory, Travel. Bookmark the permalink.